...Nia. And I am a Product Junkie. I am the junkie of all junkies. I have more than one- 3 and 4 of things- similar if not the same things. 1 off things, small things, big things, mostly full things of hair product that I mostly do not use. This pile began because I'm moving this month, and I began to pack up the dark and overlooked shelves of my apartment. I figured I could fit all of my hair products into a small box, but then I kept finding more stuff, and more stuff... and more stuff. It's like a little city. Just this past week I flipped and decided I was tired of gel, and had been wearing my hair fluffy, and then pulled back. I have not co-washed in days. I have no idea what I'll do with it tomorrow for my boyfriend's graduation from law school. Maybe I'll find inspiration shuffling though these products. Do you recognize these bottles and caps ladies? If so, you too may be a product junkie. I try not to encourage this behavior, so I tend to only review products when I have a strong feeling about them. But as you can see, I have tried everything! My hair generally tells me what it wants, and different products have different uses, and mix with other products to make yet new products. I'll def have to post a follow up to this exposure of my behavior. I was happily naming all the products until you bust me out and let me know that means I got issues! 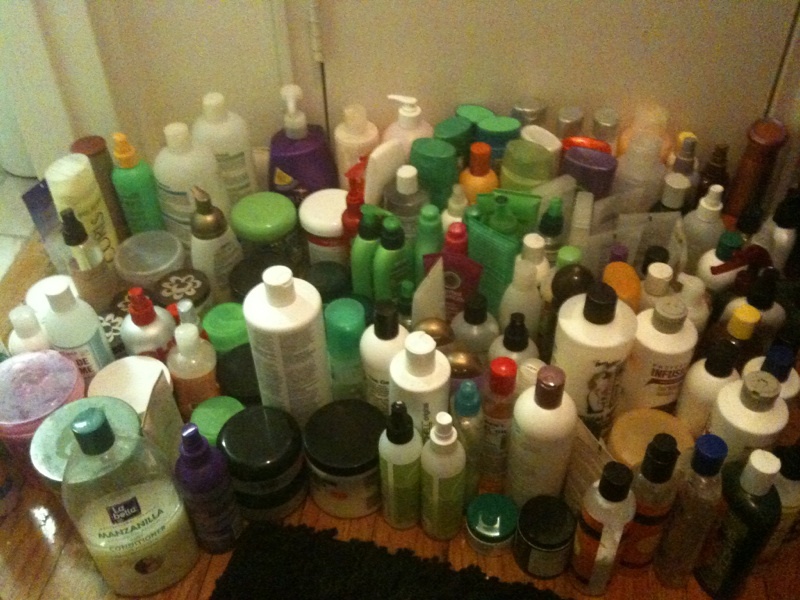 LOL I did a major clean-out last year and my stash is sadly still on the rise. Once I started transitioning, a whole new world of products came on the scene. Sigh....what's a PJ to do? wowzers...your face is priceless as you look up at camera. i was able to get rid of some stuff out of my stash. sadly i think its starting to creep back up. Maybe I really don't have a problem-you've got me beat sis! You need a PJ Anonymous sponsor!! My bathroom cabinet looked JUST like that until a few months ago when I tossed trash bags full of unused bottles and jars. I only cleaned it out bc I was moving though. LOL, literally! That picture is simply priceless. You look slightly terrified + "I don't know what I'm gonna do!" at the same time. All of those products were well worth it in my opinion. Your hair is amazing! I have a similar collection. The first thing I did was dump all the conditioners together. 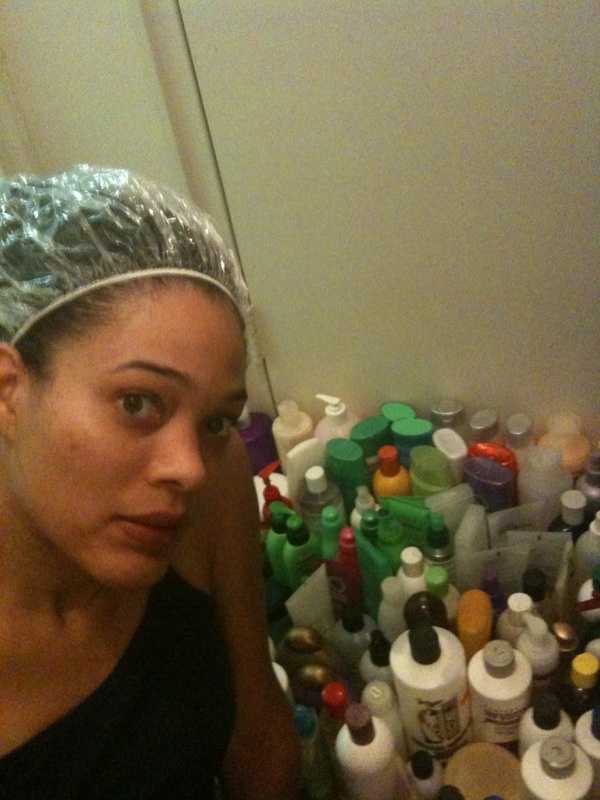 The shampoos and styling products, are still works in progress. Hi Nia - Mia here, fellow product junkie. My trick is that I send the stuff I'm bored with to my mom and then she uses it on her customers and then they go buy it too. Mwaahahahaa! And if I can't give it to my mom, my apt. bldg. has this little swap place where you can just put stuff and if people want the stuff, they take it. 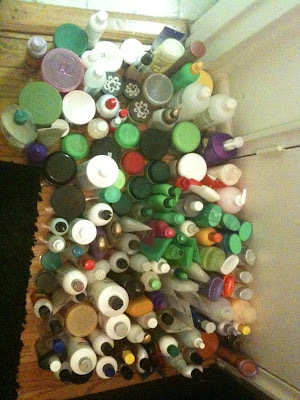 and I thought I was a product junkie lol! My pile is getting pretty close to your size though- sooo I shouldn't be too quick to judge loL!